If you’re considering a romantic tropical getaway, and looking for a refreshing change from the large resort experience, then search no further than Surfer’s Bay in Barbados. The Conscious Connection team recently visited the island from the perspective of a surf-travel loving honeymoon couple and highly recommend a stay at the Moonraker Beach Hotel. 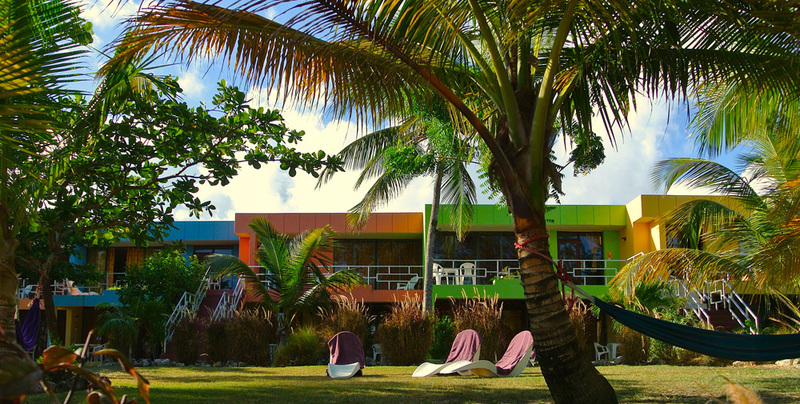 Moonraker Beach Hotel is located on the southern coast of Barbados in the parish of Christ Church, set within a backdrop of picturesque Green Garden Bay. This iconic, six-acre beachfront surf resort is a true relaxing paradise, offering the perfect balance of peace and serenity with opportunities for fun, friendly interaction with other guests and employees. Each of this secluded retreat’s 15 airy, beach-themed units is uniquely decorated. The studio units offer kitchenettes, while the one- and two-bedroom apartments offer fully-fitted kitchens. All rooms enjoy ocean views, private terraces or balconies, and free wifi. The property also features Surfer’s Bay Beach Bar and Restaurant – a highly popular dining experience. When you choose to venture out, you can feel comfortable that Barbados is considered one of the Caribbean’s most secure islands, the roads are easy to navigate, and night life can be found close by to the hotel. Since the 1970s, Barbados has been considered the Caribbean’s main draw for surfing. Warm water for surfing can be found year round. Moonraker boasts its own six-acre bay, known to locals as Surfer’s Bay. Other popular surf spots include South Point, Brandon’s and the legendary ‘Soup Bowl’ break at Bathsheba. To warm your body up for the day, consider starting with one of Moonraker’s free morning yoga sessions. Afterwards, you can move on to one of the hotel’s surf lessons. They offer both private and group lessons depending on your preference. Are you a Stand Up Paddle Board surf beginner looking to hone your skills? On site at the hotel, you can learn SUP at Surfer’s Bay and take a tour of relaxing Carlisle Bay (keep an eye out for the sea turtles) with a professional instructor and guide, all arranged by the hotel. Conscious Connection Surfer, Eric Magliacane, scoring some surf at Silver Sands in Barbados – within walking distance of the Moonraker Hotel! Other water sports that can be enjoyed close by to the resort include kite boarding, windsurfing and sport fishing. As for swimming, the hotel beach is only swimmable during calm weather and it is recommended that only advanced swimmers venture into Surfer’s Bay during the winter season (December to April). However, calm swimming beaches can be enjoyed within a five minute drive of the hotel. If you would like to fit some golf time into your vacation, Moonraker is within close proximity to the 18-hole Barbados Golf Club. If you are accustomed to large resorts, you may at first be a bit skeptical about the Moonraker and its rustic charm. However, you will quickly learn what a true diamond in the “ruff” Moonraker is when you are greeted by sweet, friendly dogs at the entrance of the hotel, accompanied by the relaxing sound of an ocean break. Moonraker has some of the nicest, most personable management and staff we’ve ever experienced. Steve, the manager, seems to truly enjoy spoiling guests by doing things such as driving them to the local food store and showing them around the island. He is always eager to point you in the right direction and offers great recommendations. Everyone on Steve’s staff is very friendly, and they all enjoy getting to know you. You will always be welcomed by smiling faces and helpful service. Our server and bartender, Gail, was very welcoming, and gave us the scoop on Moonraker as well as great menu suggestions. Staff members Natalie and Nicky also made us feel very welcome and at home. Steve and his wife take pride in this boutique hotel, and they are constantly updating the property. Moonraker is extremely clean and cozy, and the staff takes very good care of keeping guests comfortable. The view from the restaurant is truly breathtaking. We found ourselves only wanting to eat at Moonraker. Everything from breakfast, lunch to dinner was incredibly fresh and made to accommodate our specific needs. Thinking back to overcrowded bars at massive resorts where we found ourselves going back to our rooms for peace and quiet, we felt blessed by the incredibly pleasant and relaxing atmosphere of Moonraker’s rustic beach bar. And while Moonraker offers the perfect amount of relaxation during the day, it provides for a little more fun at night. After dark, soulful live music artists draws loyal friends and visitors to the bar. On the sustainability front, water is heated for the resort using solar energy. The facility also has a recycling management plan, and composts organic waste. The resort takes pride in hiring local staff, supporting national artists, and purchasing local food and products. They also support non-profit conservation efforts. We thoroughly enjoyed our stay at this secluded tropical paradise, and we are certain that you will as well. And anything you need, just ask Steve or any one on his friendly staff. They’ll be happy to help! Book your own romantic tropical getaway now at www.moonrakerbarbados.com.